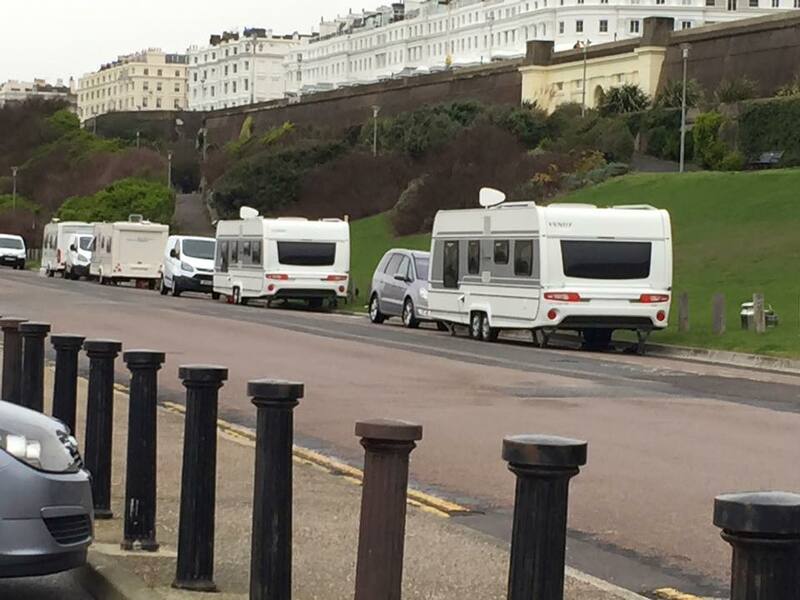 Travellers have arrived at Black Rock this week, just days before the Brighton Marathon is due to take place. A handful of caravans arrived yesterday evening at about 6.45pm, and police and council officers made a site visit this morning. A spokesman for the marathon said organisers were confident they would be moved on before next Sunday’s event, which finishes along Madeira Drive. He said: “The police and the council are aware of what’s going on and have liaised with the marathon. “The council has special powers to deal with occupations like this as our event has a special status. 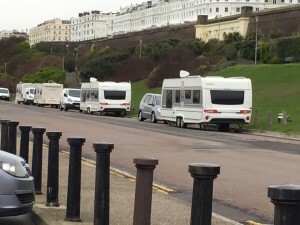 A Sussex Police spokeswoman said: “Police were called at 6.50pm on Wednesday (1 April) to reports travellers moving on to Madeira Drive, Brighton. Interesting comment – why does the ‘Brighton Marathon’ have ‘special status’, and what does the council having ‘special powers’ mean? What makes this ‘special’ versus travellers making pitches in other parts of the city on other occasions? Hush, don’t ask questions like that, Gerald. The churnalists are just hear to cut and paste the quotes they’re given, not ask what they mean. The only special thing about the Marathon is that it disrupts the whole city. People cannot get to Church or work. Buses do not run etc… Whilst i hold no brief for the travellers i do not feel that the Marathon has a greater right over them than any other part of society. Parking attendents are lethal round brighton.no sign of them here.double standards!